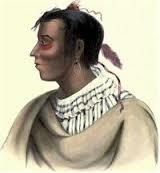 A Potowatomi chief from near the Wabash River, Metea’s birth date is unknown, although it is believed that he fought for the British during the War of 1812 and died in 1827. In Smokestacks and Skyscrapers: An Anthology of Chicago Writing David Starkey and I included one of the most famous speeches in Native American history, Metea’s August 19th speech on the second day of negotiations that resulted in the 1821 Treaty of Chicago. More than 3,000 Potawatomis came and heard Metea say, “My Father”—a traditional Native American expression of respect for whites—“we shall sell no more.” But twelve days into the negotiations Metea, Topinbee, Chebanse and other Potawatomi leaders capitulated, ceding much of what is today southwest Michigan. In her wonderful book Rising Up from Indian Country my colleague Ann Durkin Keating reports that, “Between 1816 and 1833, the Patowatomis ceded virtually all of the 18,000,000 acres of land they claimed east of the Mississippi. This was an almost bloodless conquest of monumental proportions. The Patowatomi lands cut a wide swath from Detroit to the Mississippi, moving hundreds of miles on either side of what would become the southern boundaries of Michigan and Wisconsin. The territory was taken through a series of land treaty negotiations instead of on the battlefield.” In the 1795 Greenville Treaty, the United States had negotiated for “islands” within Indian territory, but by the 1820’s the situation had reversed. Now the Potawatomi were islanded in five, 36-square-mile tracts inside U.S. territory. 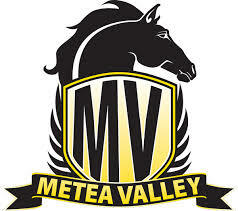 Crest of Metea Valley High School, which opened in 2009 in the Aurora-Naperville, IL, area. “My Father—Our country was given to us by the Great Spirit, who gave it to us to hunt upon, and to make down our beds upon, when we die. And he would never forgive us should be now bargain it away. When you first spoke to us for land at St. Mary’s [Ohio], we said we had a little, and agreed to sell you a piece of it; but we told you we could spare no more. Now, you ask us again. You are never satisfied! ♦ Watch a Video in which David Starkey and I perform sections of Metea’s speech. ♦ Go to Smokestacks and Skyscrapers, where you will soon be able to BUY the book, though copies are limited; and to a list of Chicago Writers on this site. This entry was posted in Chicago Writing, Diversity & Multiculturalism and tagged Ann Durkin Keating, Metea, Potowatami Indians, Rising Up From Indian Country, Smokestacks and Skyscrapers: An Anthol, Treaty of Chicago 1821. Bookmark the permalink.